RBTH presents a selection of views from leading Russian media, featuring news of the revival of negotiations between EU ministers and parties to the conflict in Ukraine, reports on the resumption of intense fighting in Donetsk, Slavyansk and Kramatorsk, and analysis of the possibility of a new gas war between Russia and Ukraine in the fall. The newspaper Kommersant writes that the foreign ministers of Russia, Germany, France, and Ukraine have resuscitated their agreement to settle the Ukraine crisis. 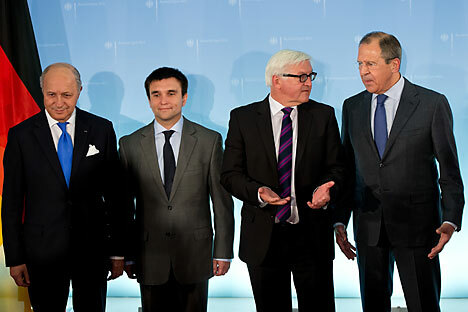 The Berlin declaration adopted by the ministers calls for a contact group to meet by July 5, with the involvement of negotiators from Kiev and the militias of the so-called Donetsk and Lugansk people’s republics, to work out the conditions for a bilateral ceasefire. Observers from the OSCE will be responsible for monitoring compliance with the ceasefire. As soon as hostilities end, Moscow will allow Ukrainian border guards and OSCE representatives onto the Russian side of the border to jointly control it in the regions in which Ukrainian checkpoints have been seized by militiamen. Gazeta.ru writes that a gas war may ensue between Russia and Ukraine in October, when the latter might begin illegally siphoning off Russian gas from European transit flows. Naftogaz Ukrainy had previously expected to be able to hold out until the end of the year by using reverse supplies and accumulated reserves. However, even if gas supplies from Europe increase, Ukraine will not be able to pump a sufficient amount of gas into storage to meet its needs. Ukraine is currently not receiving Russian gas for domestic energy needs. Gazprom switched Naftogaz to a prepayment scheme after the Ukrainian company failed to pay off its debts, and the Russian company started providing Ukraine only with transit gas, Gazeta.ru reports. Gazprom has said that daily gas transit will remain unchanged and acknowledged that Ukraine is not currently removing unsanctioned gas, Gazeta.ru writes. Expert reports on the state of Ukrainian cities the day after the ceasefire ended and the anti-terrorist operation resumed. Fierce battles were under way in the suburban village of Karlovka near Donetsk, while shooting could be heard in the very center of Donetsk. However, according to Expert, the most intense battles are being fought in Slavyansk and Kramatorsk. “The sheer intensity of the reciprocal attacks is evidenced by the collapse of a 222-meter-tall TV tower [in Slavyansk],” Expert writes. “At this point, one can confidently state that the resumption of active hostilities in Slavyansk and Kramatorsk has led to a state of full-fledged humanitarian catastrophe,” the journal reports. Residential buildings came under fire in Kramatorsk, and several buildings, including a municipal hospital and maternity ward, have been left without electricity. Meanwhile, fierce battles are also under way on the internet, with diametrically opposed information about victories and defeats being posted online. “It seems there have been no fundamental changes in the state of affairs at the front. However, according to various sources, the number of casualties could be high,” Expert reports.